Clicking the Edit (pencil) icon in the top navigation bar will open the Edit Stage Order window. 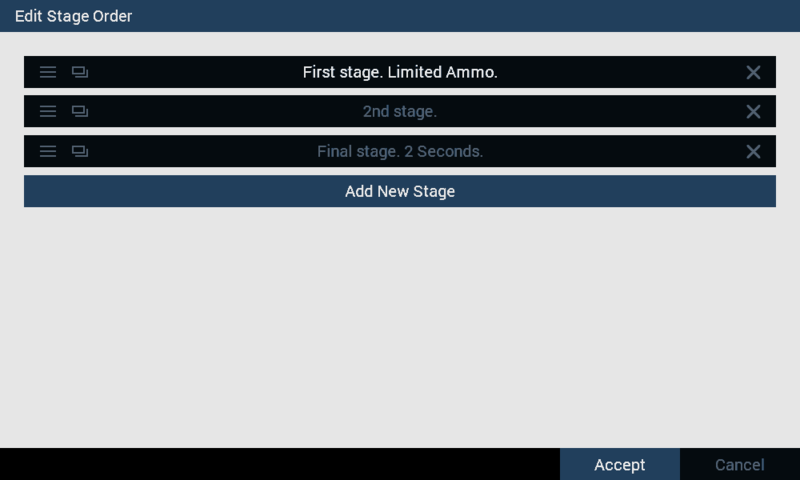 Here you can name and rename stages, delete stages, add a new stage, clone an existing stage, and change the order of stages. Each stage is given a bar with options related to that stage. Important! Deleting a stage cannot be undone; however, changes to the stages are not saved until you click the Save button at the bottom of the dialog window. If you make a mistake, simply click the Cancel button, and the course will remain unchanged. Note: Unlike the Clone icon, adding a new stage creates a stage with all default settings.